This post is all about the new and different skincare procedures I have recently been doing. Today we are going to talk about micro needling, Microderm Abrasion's, Luxury face masks, and what products I use on my face every night before bed. This includes all of my updated skincare steps! Hope you all enjoy todays lengthy post, and be sure to let me know what you've tried out in the comments! Now the reason I only do these treatments once a week, is because they are very intense treatments and if I were to do them everyday my skin wouldn't be able to recover. I also typically like to do these treatments a few days apart in order to help my skin heal / breathe in between procedures. So the first new treatment that I have added into my skin care routine is something called "Micro Needling." Micro needling is basically a little tool that has a roller ball full of needles at the end of it. Now I know that sounds terrifying and I'm sure your like why would any one want to rub needles on there face? But I promise you there is no pain involved and it can help change your skin. Well by using a micro needling device you can help heal any old scaring or acne marks on your face, as well as help reduce discoloration, and it can even help tighten the contours of your face and reduce wrinkles! Not to mention that you can use it to reduce stretch marks and even can help with hair growth. The reason micro needling can help with so many different things is by something called skin cell regeneration. The needles actually slightly break the skin and leave miniscule "injuries" that make your cells react right away to heal the skin. This is also what helps to stimulate the skin to create new collagen - reducing wrinkles. Micro needling also helps make a base for all of your skincare products to seep into. As by using the roller you increase the absorption of your products into your skin. I got my whole micro needling system from the website below. It comes with a facial spray that you use before application and a mask that you use after application - all natural products - all for $35. The PMD. One of the coolest at home devices on the market right now. Basically how it works is by using a tiny spinning disc, the skin is buffed and exfoliated removing all of the dead skin cells making new skin cells appear creating a healthy rejuvenated complexion. PMD uses a suction like technology to help remove dead skin and increases blood flow building collagen. 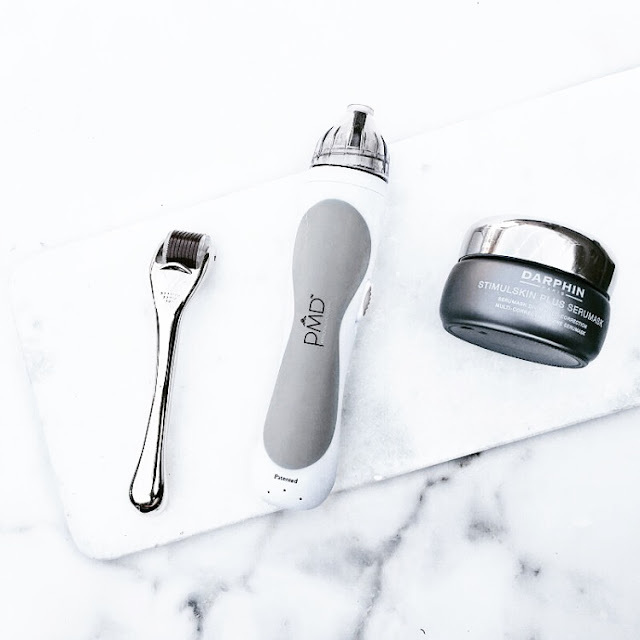 The Personal Microderm uses an exclusive Patented Spinning Disc with aluminum oxide crystals to exfoliate away the dead, dull cells on the surface of the skin. This patented spinning disc effortlessly performs the exfoliation without any manual scrubbing. By removing this dead skin cell barrier, new cell growth is stimulated and renewed, revealing soft, brilliant and rejuvenated skin. Use the Personal Microderm weekly to regenerate and renew the skin, training it to become more youthful, vibrant and revitalized. Many products contain the name “microdermabrasion”, yet they often lack the vital suction that creates true microderm. Suction is the power behind microdermabrasion, and the benefits of a calibrated vacuum suction go far beyond simply removing dead, dull skin cells during the exfoliation process. The vacuum suction provides real results including softer, tighter, and more vibrant skin. .Through the use of a Patented Spinning Disc, the Personal Microderm effortlessly removes the dead, dull skin cell barrier. Once this barrier is removed, skin care products fully penetrate the skin’s surface. This maximizes the benefits of the skincare and helps to restore and perfect the skin, leaving it soft, luminous, brilliant and bright. You can get the PMD at the link below. The kit I received has not only the device but also a three step skincare system that I always use on the night of the treatment. Recently I have been trying out so many new face masks. Ones to help clear the skin, ones to hydrate I've been trying them all, & I think I have found my favorite. If you guys have been following me for a while you would know how much I love the Darphin Paris line of skincare. Recently I decided to try out there new mask called "Stimulskin Plus Serumask." It is this beautiful anti - aging mask that helps target radiance, texture, lines and wrinkles, skin contours and firmness. Like I said before I am constantly trying to find products that will help make my skin contours super defined so this product really jumped out to me! I would describe it as a moisturizer type of texture, as it doesn't really harden up like a typical mask. All you do is leave it on your skin for an period of time ( I typically apply this right after my mircro needling session ) and then either remove the excess with a tissue or just rub the rest of the product into your skin. You can purchase this amazing luxury face mask + brush from the link below for $190 USD or $225 For the 50 ml jar - the one I have. I use two things to do this job. Regular make remover wipes ( I get the Neutrogena ones from target ) or a cleanser. The cleaner I use is one from Tatcha called the "One step pure camellia cleansing oil." All you do with this is take a few pumps and apply it to your skin dry. Then let the oil break everything up and then rinse like a normal cleanser. I have been using this stuff for month and Its absolutely amazing! I swear to you guys I have found the best and cheapest face cream ever! One day I was browsing the internet and came across a skincare routine where someone was raving about this Nivea skin cream that was perfect for dry skin. Later that day I was out and about and found that exact skin cream for $1! ONE. I was so excited to try it out, but also hesitant because like $1 skin care sounds like a recipe for disaster. Now while I love this cream and swear it has completely changed my skin ( it makes my face feel as soft as butter the next day ) I honestly don't know how well this would work for other skin types. Like I said before I have normal to dry skin and it works great but if you have oily skin it may make not work as well. But hey its only a buck so regardless of your skin type I would totally recommend trying it out for yourself. I got mine from dollar tree, however I have seen this cream and larger jars of it at pretty much every target, Walmart, and drugstore I've ever walked into. Step 3 - Under Eye Cream + lip contour cream? I use this cream every night after moisturizer under my eyes and around my lips. Now you guys are probably like, 'around your lips???' Yes around the lips. This product is specially made to help refine the lip contour to soften the expression lines and to enhances skins elasticity. It also works under the eyes to reduce signs of fatigue and visibly minimize shadow zones and puffiness. This last part is pretty self explanatory. I use a good lip balm or or lip butter to help heal my lips from all the drying liquid lipsticks I wear! I have left my top three recommendations below however right now I am using the lip treatment from Sugar fresh. This is the best chapstick type of formula I have every tried. It leaves the lips feeling extremely hydrated and soft. That's it guys hope you enjoyed this very lengthy post and I be sure to leave a comment either on here or on my Instagram page and let me know what skin care I got to try out!